I was watching a science program on TV the other night, and they were discussing how life might have begun on Earth. (It’s funny to me that I know, yet so many scientists still don’t know.) There are numerous theories / hypotheses, and one of the main ones is that life started by accident. Supposedly amino acids in primordial soup collided with each other many times, until the right combination was formed to produce life. (And I have to wonder — who was first, male or female?) Amino acids are part of the building blocks of life. The second widely-held theory / hypothesis is that an asteroid with frozen organisms deep inside crashed into Earth. This would mean that we’re all aliens, and that life as we know it came from another planet. But even if life came from another planet, it still had to start somewhere, somehow, since the Universe was formed by the Big Bang. So let’s go back to the first theory. Life had to start somewhere, obviously. If colliding amino acids can create life, then you could create life by slapping pieces of bacon together enough times. (You may think I’m being silly, but hold on.) 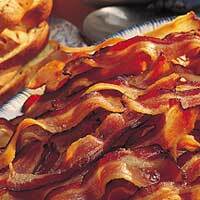 Bacon contains amino acids. Actually, science explains that part of the reason we are attracted to the smell of bacon cooking is because of the chemical reaction of amino acids and reducing sugars. (It’s called a Maillard reaction, if you wish to do further study. That reaction also contributes to the taste of seared meat and roasted coffee.) Of course, another reason we’re attracted to the smell of bacon cooking is because it smells awesome. Wow… the power of bacon! Obviously a corollary to this new theory would be that eating bacon adds to your life. True indeed! Upon further intellectual examination, the article code of Book 12, Chapter 1, Section 1, article Threve concludes that bacon & butter make anything Mo Bettah. Go now and assemble yoselfs a Mo Bettah Butter Bacon Sammich! I don’t get it. I slap bacon together all the time and it never forms life. Have I been doing it wrong this whole time? So would this create a bacon animal? I think that would be the best animal to hunt ever. And forget rifles, I’d hunt bacon with a flamethrower. I don’t know about creating life, but I do know that roasted coffee, seared meat, and bacon make life better. I don’t know ’bout no acid, though unless you’re talking ’bout a good Bradley County ‘mater!